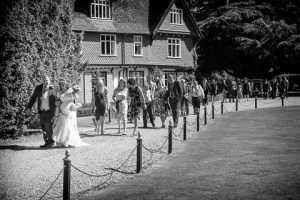 A Wedding Fair (or wedding fayre?). 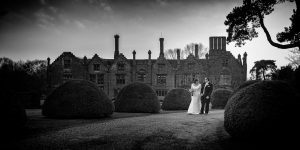 The happy couple at All Manor of Events, Henley near Ipswich, Suffolk. To be honest, I have no idea and have to admit, don’t think the spelling is that important. So what’s this blog about then? Well, I’ve attended a wedding fair. Now I hear you say, “so what’s the big deal?” Let me explain. 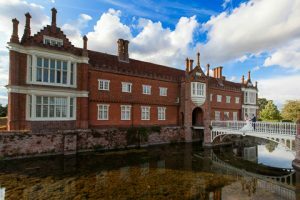 Those of you who have read my earlier blogs, particularly the one about attending wedding fairs, will be aware that it’s very rare I actually exhibit at them. If you haven’t read it yet, here’s a link to make it easy to find. Photography as a business – dream vs reality part 3. 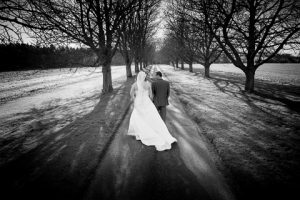 So why do I choose not to attend many wedding fairs? Well here’s some of the main points for those that haven’t read my previous blog on the subject. 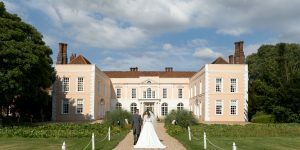 Some venues organise wedding fairs in order to attract couples to their venue. 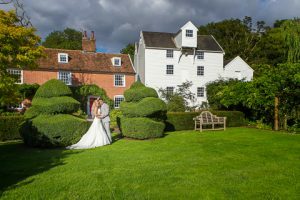 In short, they would like the couples to use their venue for their wedding day and they invite along a few suppliers they have worked with and trust, charging them a nominal fee for a table or “stand”. In my humble opinion, this type of fair is worth going to. Nowadays a lot of wedding fairs are organised purely to make money out of the suppliers. Your cake makers, photographers, suit hirers, florists, car hirers and so on. Often taking place in a venue where weddings are rarely if ever held, the organisers charge the vendors a high price for a table or “stand” and will charge for every “extra” (such as a table cloth or even a cup of coffee) to make as much money as possible out of the suppliers. In my humble opinion, we suppliers should avoid those type of fairs. So how did I get to attend a wedding fair? 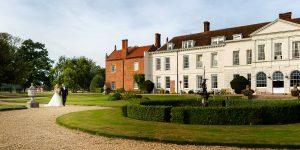 Well, a few weeks ago I was invited to a two day wedding fair at All Manor of Events in Henley, near Ipswich in Suffolk. I jumped at the chance. 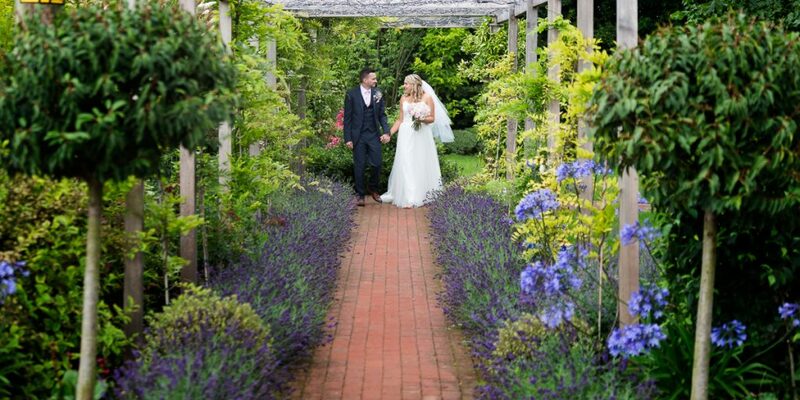 I’ve worked at the venue on many occasions over a number of years and seen it grow to become a first class wedding venue. I photographed the very first wedding they held in their “Poplar Barn” and, with the addition of a woodland setting later this year (the owner Andrew took my wife Michelle, who is a wedding celebrant, and myself up to the woods for a little preview), couples will have a choice of at least four different settings in which to hold their wedding ceremony. 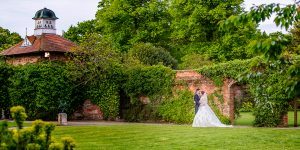 There’s the “Chestnut Barn”, the newly refurbished “Poplar Barn”, the outdoor ceremony room known as “The Garden Room” and this most recent area in the woodland. The photographer in me can see the rays of sunlight coming down through the tree canopy while the ceremony is in full flow, simply beautiful and I can’t wait to photograph a wedding there! Being a photographer, I always note how many other photographers are present. I see no point in me attending a “photography show” at a wedding venue. There were three of us and I think the organiser had given this matter serious thought because, though the three of us are of a similar pricing point, we all offer something different and have completely different styles. So, how did it go? Day one, the Sunday, was open from 11.00am until 4.00pm. The weather wasn’t brilliant but it didn’t stop people from coming. It was well attended and I ended up the day with six very interested couples. How do I define an interested couple? These are the ones that come over to your table, stand and chat with you, ask a lot of questions and then ask how they can get in touch with you after the fair. As for looking after us suppliers, the staff of All Manor of Events were brilliant. Not only was the coffee free, they provided us with a light cooked lunch as well. Like I said earlier, their food is always terrific!! On day two, the Monday, the fair was open from 12.00 mid day until 9.00pm. Why so long? It’s to give people the opportunity to come when their children are at school during the afternoon and for those who work on Sundays to have the option to attend on the Monday. The weather really did not play ball. It rained really heavily ALL DAY and was very cold for the time of year. Needless to say, that affected the number of couples willing to “turn out” in order to attend. 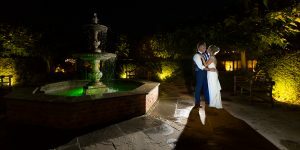 There were some couples brave enough to come in the evening but I suspect most of them had appointments to see the venue staff to either book the venue or sort out a few details for weddings later this year. But no one can control the weather and Michelle and myself took the opportunity to “network” with our fellow suppliers. Michelle had worked with one of the other photographers last year, and she is working with the third one later this year. I spent time chatting with all the other suppliers (including the other two photographers) and found them all to be a really friendly group of people. None of the nasty “competitive” type of behaviour I have experienced at some other wedding fairs in the past. Was it a success for me personally? If you judge your success by the number of bookings you receive, I will not be able to answer that question for some time yet. Six couples who I believe were genuinely interested in what I have to offer and who are getting married in 2019 and 2020. They may get in touch in the coming months, they may not. Time will tell. I prefer to judge success by asking myself the question, would I like to go to another fair at this venue? Without any hesitation, YES, ABSOLUTELY I WOULD. I love the venue, I love the staff, the other suppliers were a great bunch of really friendly people and, in case I forgot to mention it before, I love the food!! 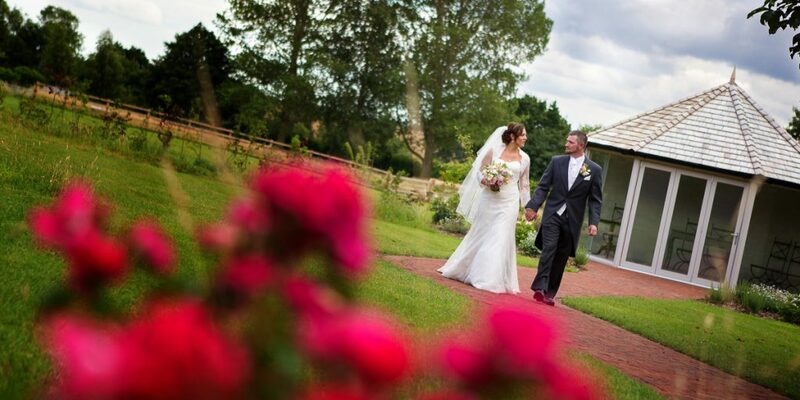 The happy couple go for a stroll near The Garden Room at All Manor of Events.